I have taken a few pictures in the past several days, but am just getting around to posting them. I have admired these bushes with the multi-colored leaves in front of Dave and Teresa’s trailer for several years, but this is the first time we’ve been here to see them bloom. Surprise! They are hibiscus and have beautiful red blooms. The papaya tree is bigger every day. Here, my scale model Andy is standing next to it for, well, scale. This is at about six months, from a seed. It is blooming! And, it’s a girl. 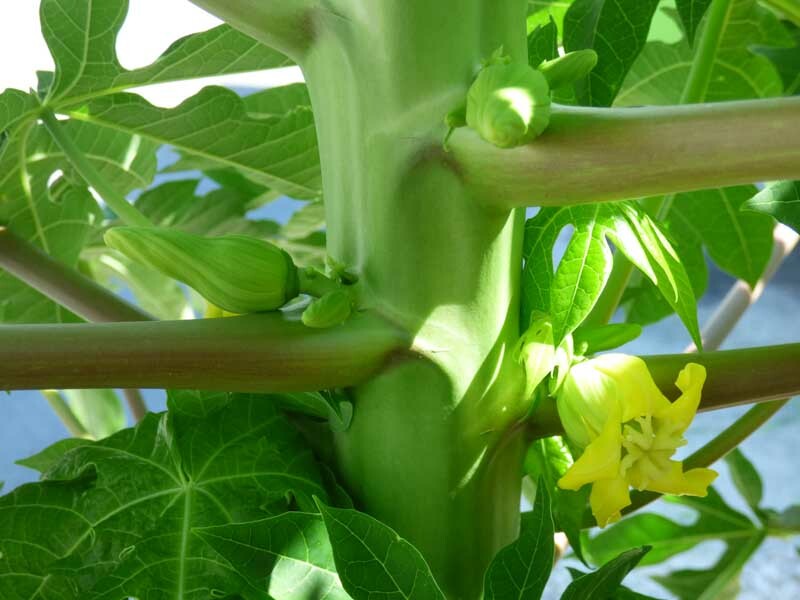 The blooms of the female papaya come right out of the trunk (or maybe it is a stem). It makes sense. Those huge, heavy fruits would break off a branch. 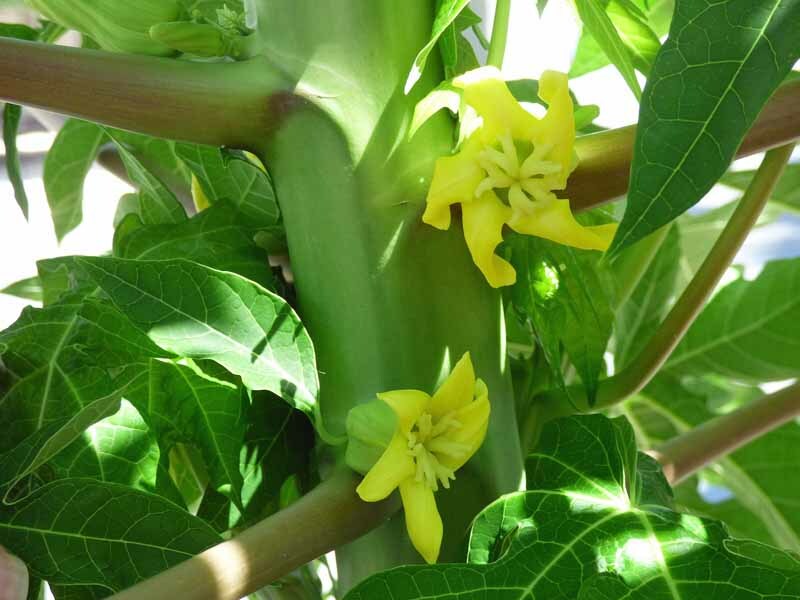 I found some male papaya flowers on line for comparison. The papaya that my neighbor Curtis pulled out of the ground for seems to be surviving. I hope it is a boy (or both male and female) so I can get some fruit. It is sad to be leaving with all this plant excitement, but it should still be producing when we return in the fall, if the neighbors water it when needed. More plant excitement today! 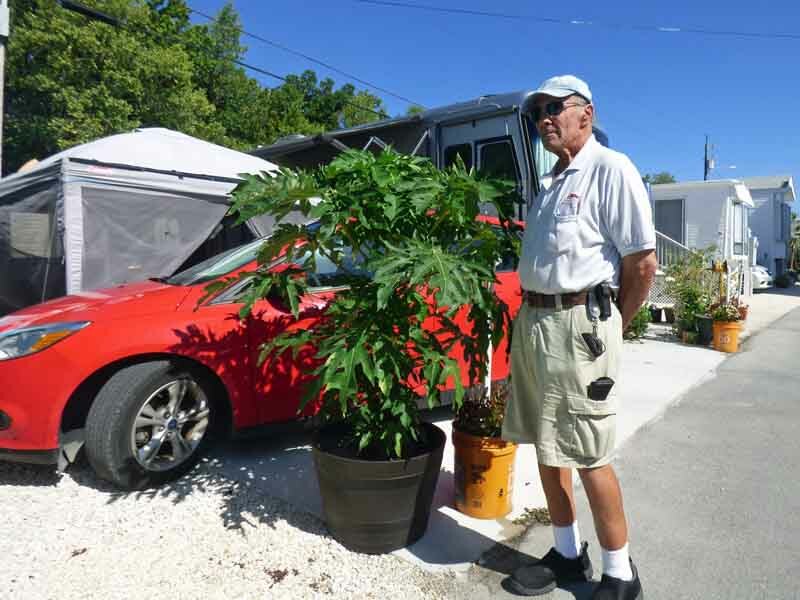 We were packing up our outdoor furniture and screen room and then I moved the plants that are still alive from the front of the motorhome so I can drive out in the morning. I noticed that one of the three coconuts has sprouted! I forgot to take a picture. Don’t forget to send me an email at dinata@gmail.com if you want to get my updates from the Great Smoky Mountains National Park. I’ll be writing them off line and sending them out when we go out grocery shopping once a week. It is something new every day in the park. It has occurred to me that we probably won’t have internet access when we get to the Great Smoky Mountains National Park. 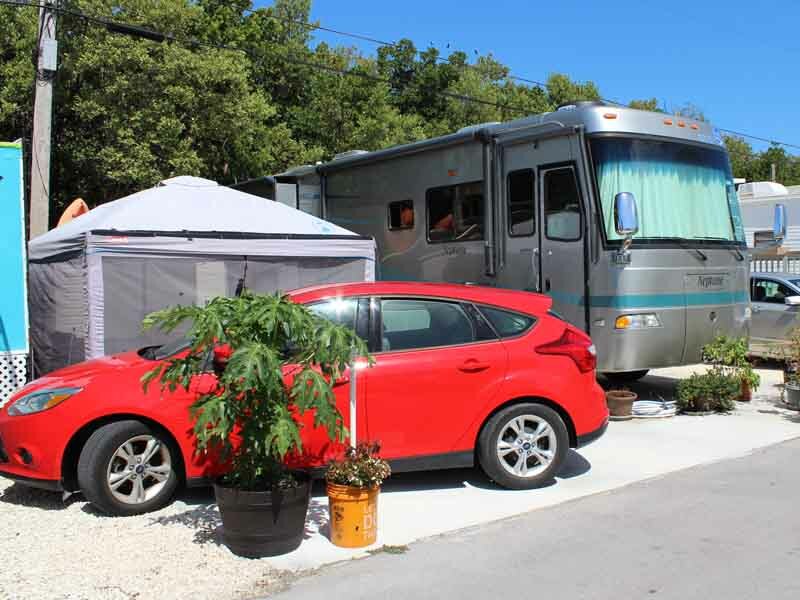 Although we did get a cell signal for our hot spot the first several years, we did not get one last year, in spite of the signal booster Andy mounted on top of a PVC pipe above the motorhome. It was too awkward to post all the logs on the Big Creek blog while we ate lunch in town once a week. It took way too much time. I need to compose off line with Outlook and then send/receive when we go to town. If you used to get the Sao Updates and switched to the blog, send me an email too. I may have deleted you from my distribution list so you wouldn’t get double notices. Mary sent me a photo of Grace and Max, the two dogs we dog-sat a while back. They are so sweet. It was not the best winter season, but it is over now. I had a second colonoscopy in six weeks yesterday. All the news was good. That huge polyp observed from the first colonoscopy turned out to be doo doo (Dr. Jones’ medical terminology). This time, it was not even there at all. All the biopsies came back negative. There’s no cancer up in there folks! I had my last session of physical therapy this morning. Arjen, at Island Physical Therapy, is a genius. My range of motion is not back to 100%, but he sent me home with a set of exercises to work on while we are on the road. All the worst pains are gone; I just have a few jolts with certain movements, not nearly as bad as before. If all goes well, we will hit the road for our summer trip tomorrow. As soon as I get this rig out on the highway, I’ll start singing, “On The Road Again”, one of my favorite songs. We never see the children and grandchildren often or long enough. But, we did have several very nice days when daughter Kathy came to visit for a few days this week. 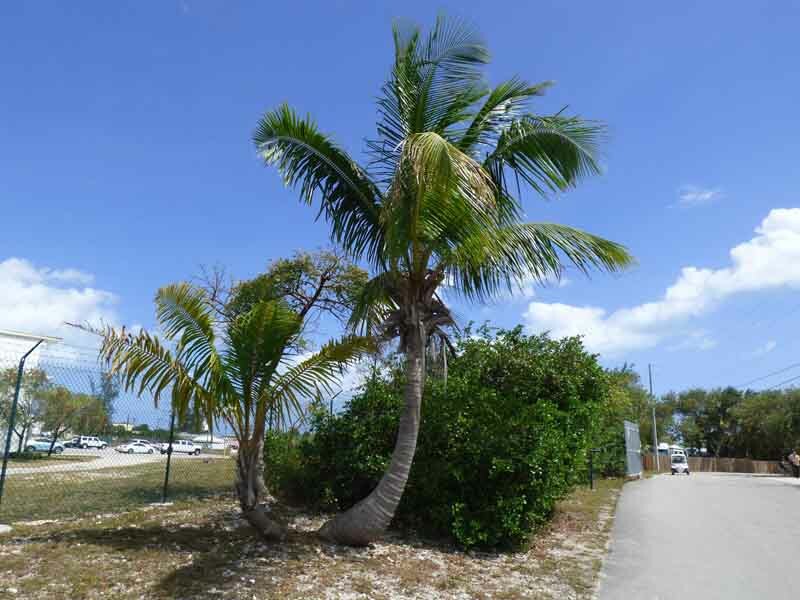 Our first outing was to Key West where we showed Kathy Zachary Taylor State Park. First, we walked into town for lunch at Blue Heaven. We had not been there in several years and I was thrilled to find the Shrimp and Grits on the menu (as opposed to being a Sunday-only dish in the past). Seating is outdoors under the trees with cats and chickens wandering around. Here is the entrance. I have passed this, or these, trees many times and just noticed them. Yes, it is the rare “J” Palm. After touring the fort, we took a walk along the beach. 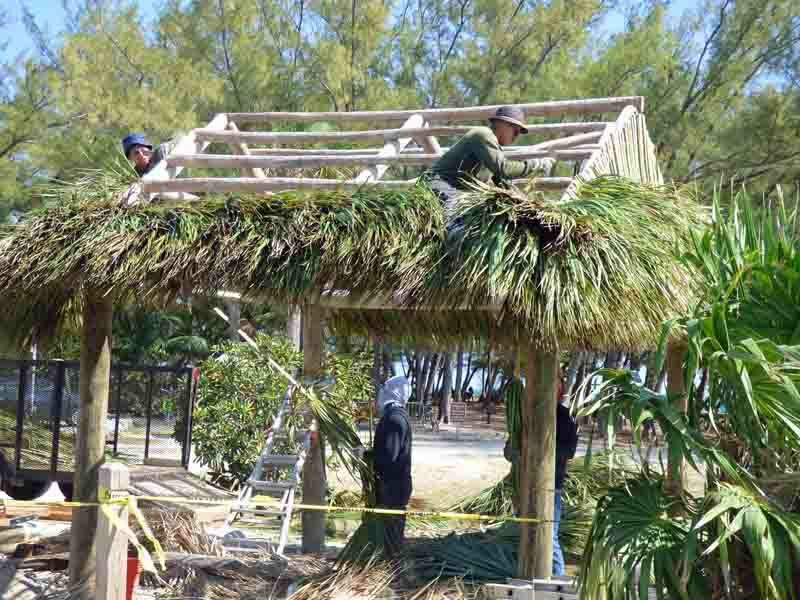 Although there are many tiki huts here in the keys, I had never seen one under construction before. We stood and watched for a while. 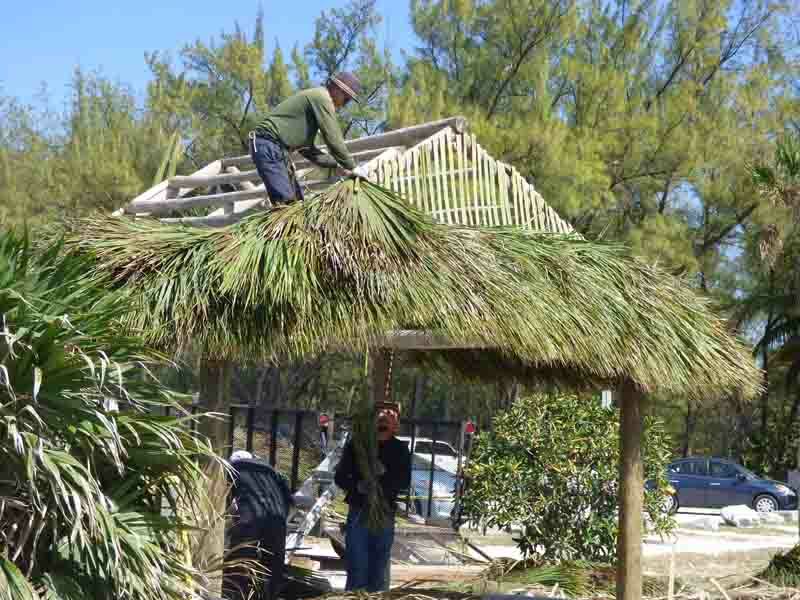 Two men on the ground were handing palm fronds to the two men up on the roof, who were nailing them down almost as fast. It was fun to watch, but we did not stay long enough to see the finished product. 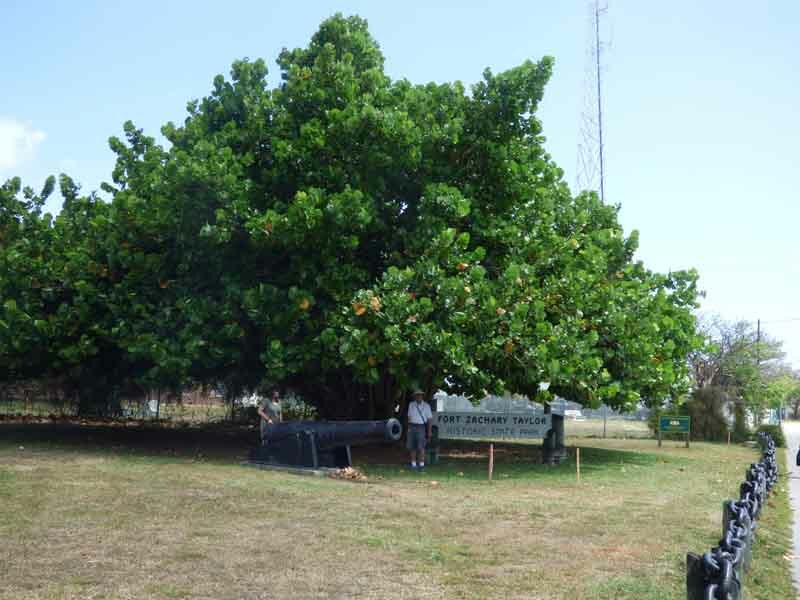 Here is another tree I have seen many times. This was the first time a got a good picture of it. It is a sea grape, the largest I’ve ever seen. Can you spot Kathy and Andy posing next to the canon under it? This was to be a relaxing vacation for Kathy, so we took her on our favorite walks each day. 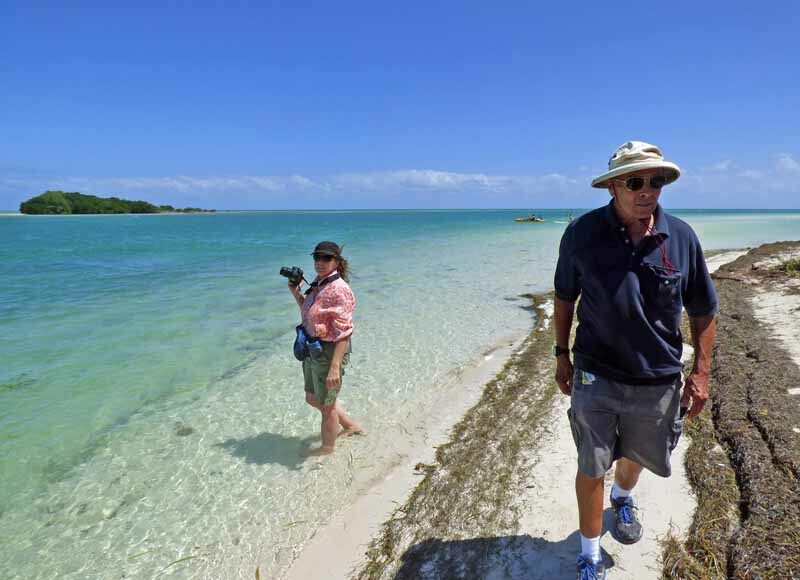 At Bahia Honda State Park, Kathy opted to walk in the water while Andy and I kept to the dry sand. 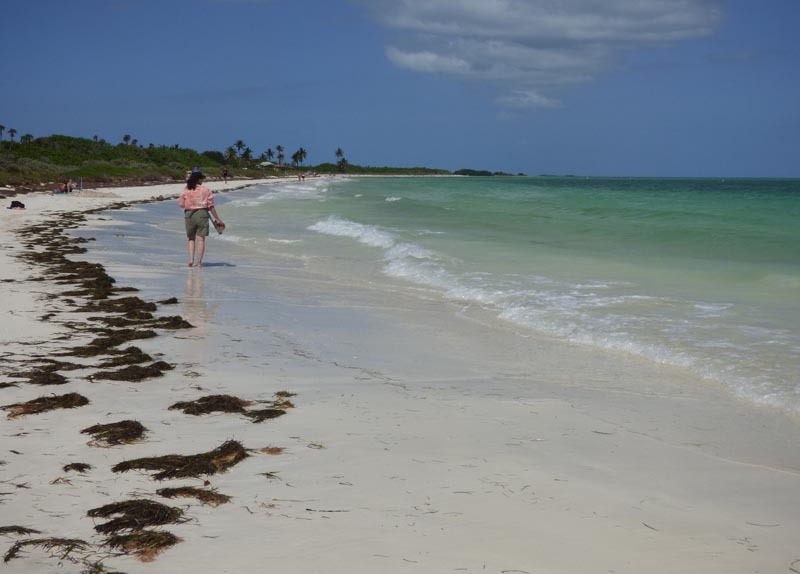 The tide was very low again so we had plenty of beach to walk on. I don’t think I have posted a papaya update lately. It is taller than the car now. 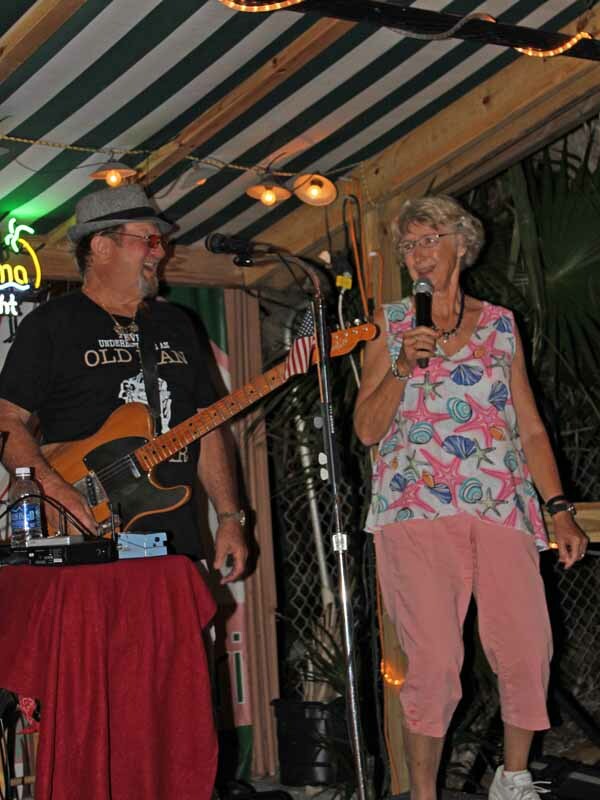 Dave Scott was playing at Lulu’s, so we took Kathy. I sang a few songs and Kathy took this picture. I have always like that top, but now I think it makes me look pregnant. 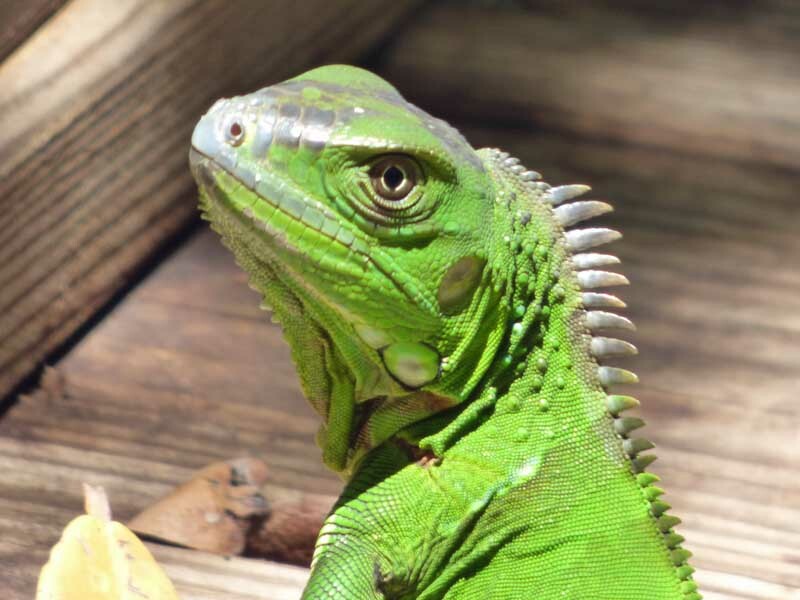 We saw this iguana on the boardwalk at Oceanfront Park. I zoomed in on the head so you can see all the interesting detail. They look prehistoric. 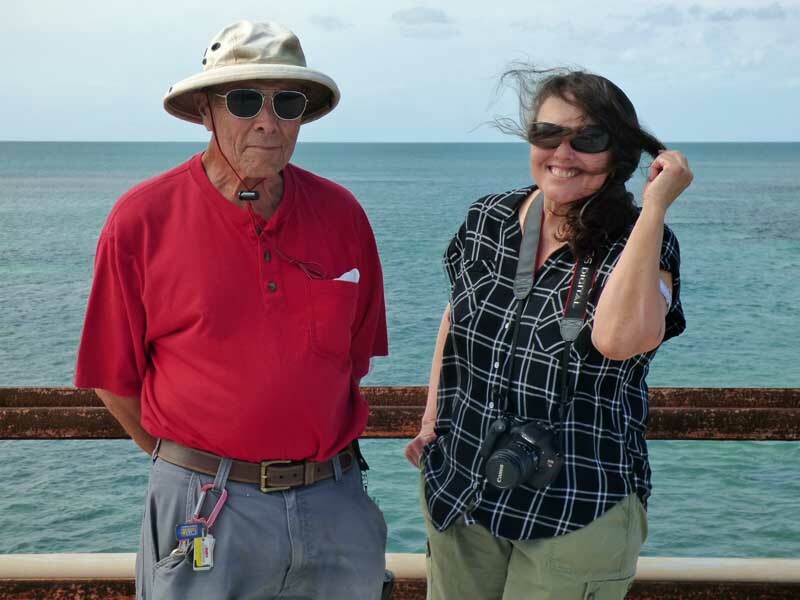 We also took a nice walk on the old Seven Mile Bridge. 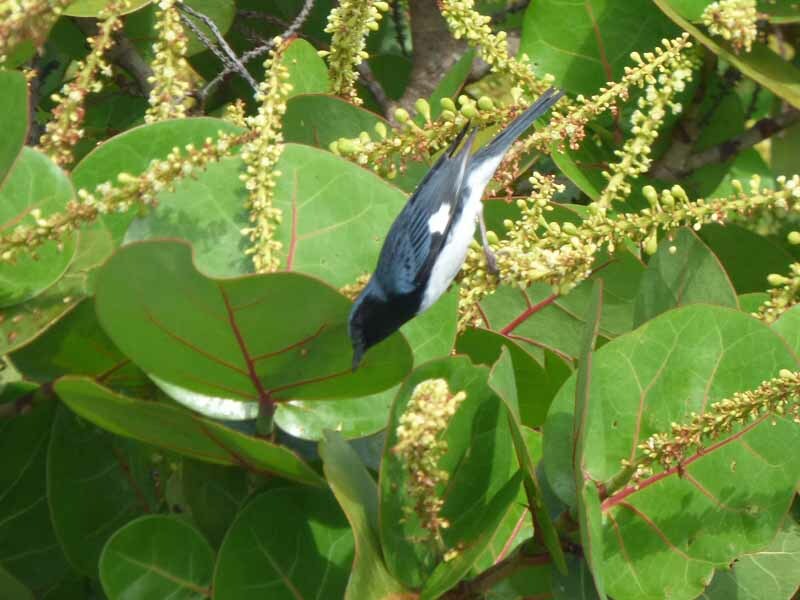 I spotted a strange (to me) bird in the Sea Grapes on Pigeon Key. It was busy eating. A quick Google image search told me that it is a Black-throated Blue Warbler. I didn’t get a good clear, sharp shot; this is the best I could do. 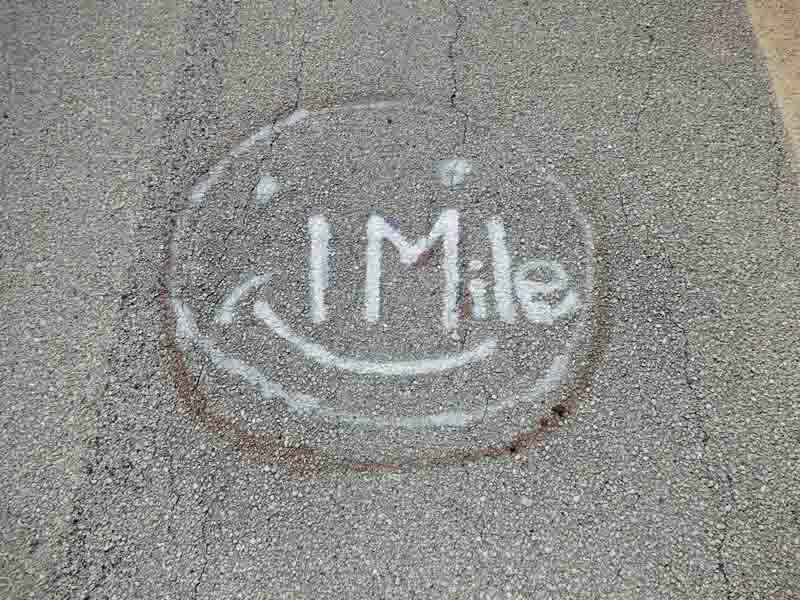 Someone has marked the distance on the bridge in quarter mile increments. The one-mile mark is fun. 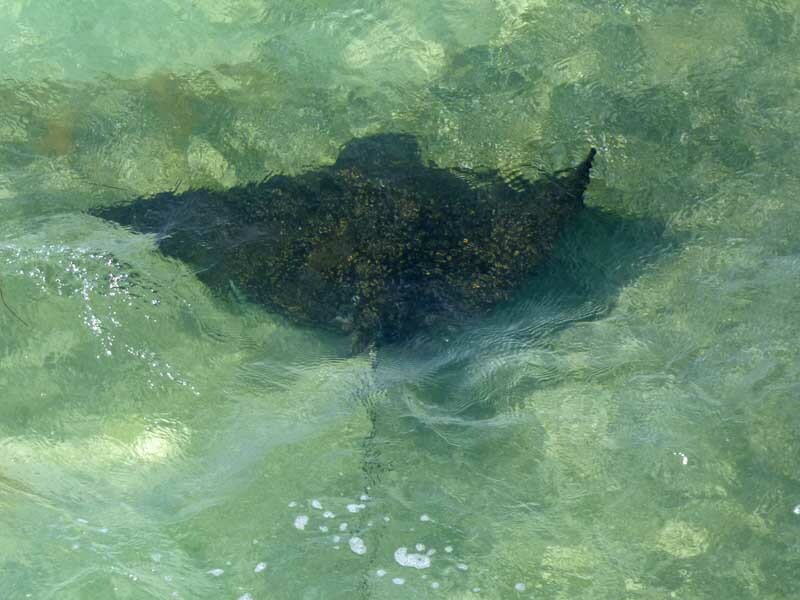 We saw a Spotted Eagle Ray, also known as a Leopard Ray. It is so hard to get a clear picture of them through the moving water. Again, this was the best I got. I did get a nice, good, clear picture of Andy and Kathy. She was holding her hair, but the wind was blowing hard. I don’t know why I didn’t have the picture of Dave and me. Maybe the computer bugs ate it. I still think that outfit makes me look pregnant. Bill and Mary, from Maine, camped down on the ocean front, needed dog sitters for today. We said we would be happy to do it. It is a pretty easy job. 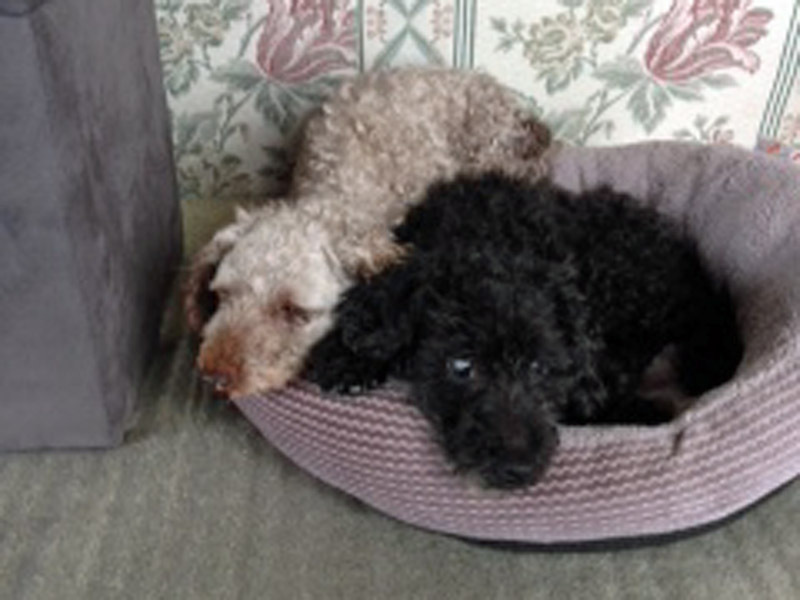 The two old poodles are quiet and mellow. What makes it interesting is that Max is blind. And, he needed his insulin shot. I visited their trailer a few days ago to administer the insulin under Mary’s supervision, so I was prepared. We walked to their trailer after breakfast and got the dogs out of their crate. We put the leashes on and I carried Max out of the trailer. He hasn’t mastered the steps yet. I ended up carrying him all the way to our motorhome. Max had never been here before. The first thing he did when I took off his leash was to fall down the steps. I set a few things there to keep that from happening again. He may be old (16), but after exploring for a while, he was able to wander around without bumping into anything. I forgot the female’s name. Andy decided she wanted to play and tied some socks into knots for toys. We chased her around the motorhome trying to steal the socks and she had a grand time running from us and teasing us by coming almost close enough for us to grab a sock and then running away. Max napped in the dog bed. It was fascinating to watch her take the socks and put them in the bed with Max. She also spent a lot of time licking him, as though for comfort. Loving little doggie caresses. We took them outside for a few hours mid-day. I gave them each a Pupperoni dog treat when we ate lunch. Then, it was back inside for naps. We took them home about six o’clock and I gave Max his insulin shot and served their dinner. He is good about getting the shot because he knows that means he’s getting fed. Mary makes their food: scrambled ground beef with some grains and vegetables. It looked good enough for Andy and I to join them. We didn’t. I love dogs and really enjoyed snuggling with them. It was a fun day for me.